The church’s neo-Gothic design resembles a European cathedral. In 1905, Evangelical Lutheran national church leaders envisioned a new mission in Madison, WI that would use English as the primary language and service the students at the University of Wisconsin. With that, a small Bible study group founded Luther Memorial. 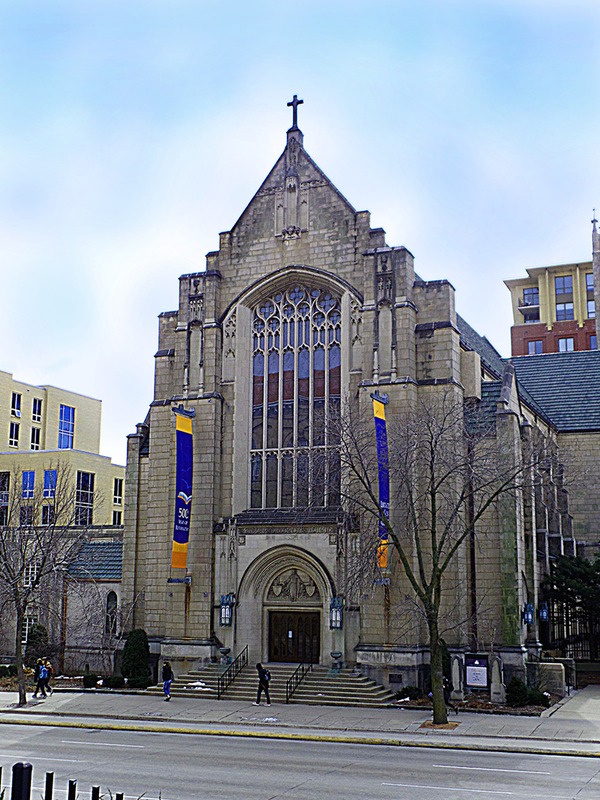 Over the years, the congregation grew, and in 1923, they dedicated a new church, built in a neo-gothic architecture that reminds one of a European cathedral. Listed in the National Register of Historic Places in 2018, the building stands tall in the heart of the University of Wisconsin campus and services the intergenerational faith community in the region of the state’s capital. Entering the nave, a stone living-water font greets worshippers into this architecturally stunning worship space. The floor plan is laid out in traditional cruciform design. With a 40-foot high arched ceiling, the domed apse frames an ornate centerpiece that rises two stories above the altar with a statue of Jesus looking down watching over his flock. On either side, ornamental organ pipes add to the majestic look with their 56-rank Austin pipe organ and Steere tracker organ. Achieving even coverage within the main sanctuary and two left/right transcepts was a problem with the existing system. In 2016, Luther Memorial leaders developed a new master plan for the church. 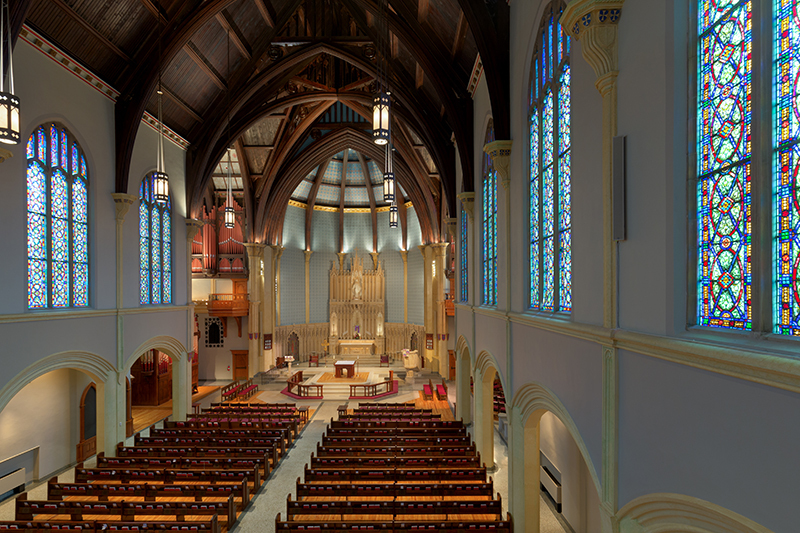 This included infrastructure improvements ranging from a new permanent, free-standing altar platform to replace the aging “temporary” platform that was installed in 1988, restore the walls and flooring in the nave area and bring its antiquated lighting and sound systems into the 21st century. Milwaukee-based Kubala Washatko Architects was called in to assist in restoring the church to its original grandeur. They noted, “The sanctuary suffered from poor lighting and acoustics,” aside from numerous other structural defects highlighted in the church’s master plan documentation. Having worked previously on audio systems with system design engineer Jason Keagy from Baraboo, WI-based Peak Systems Group, they were invited in to partner on the upgrades. The existing audio system combined speakers built into the pews with a pair of two-way passive cabinets perched high on the proscenium for precedence. According to Peak Systems’ project manager Mike Mundth, intelligibility was seriously compromised by the room’s nearly three-second delay time. 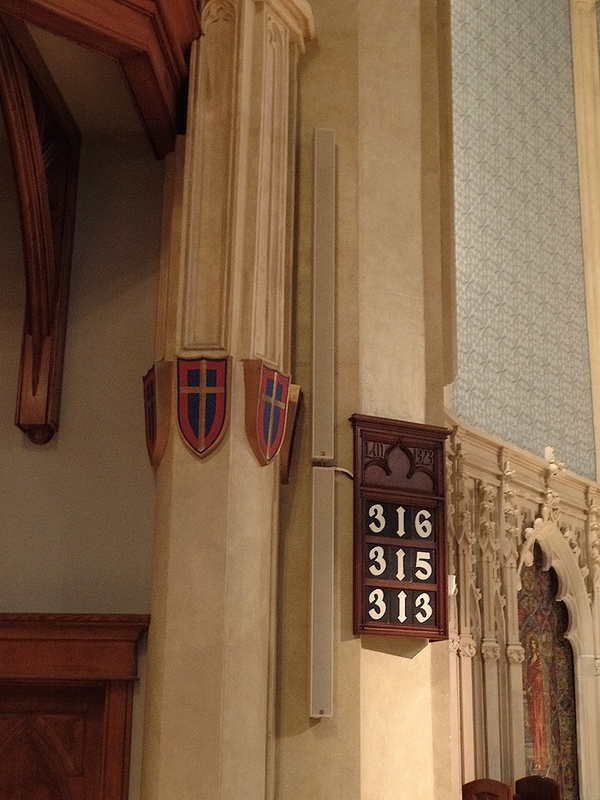 Stacked RCF VSA 2050 and VSA 1250 steerable column arrays (shown here next to the hymn board) on both sides of the altar area provide most of the required coverage and are relatively inconspicuous. Having previously worked with RCF’s VSA steerable array products in other projects, understanding the technology, the Peak team felt these would be a perfect fit. The VSA allow for a digitally steered soundfield for direct coverage to the seating area, eliminating unwanted reflections and room reverberation. The VSA’s low-profile, five-inch-wide column design allows for integration without altering the sanctuary’s architectural décor, making them practically invisible in the installation. One design issue Peak needed to deal with was the need to cover short transcepts, along with the free-standing altar platform, where at times the pastor may be facing the congregation and members kneeling on three sides. With a 100-foot throw from the speaker position to the farthest row of seats, Peak opted to use one RCF VSA 2050 and one VSA 1250 on either side of the altar area. The VSA 2050s have an 89-inch enclosure with 20 3.5-inch drivers, each driven by onboard 50-watt amplifiers under DSP and RDNET network control; the VSA 1250 is a smaller 53-inch version, with 12 3.5-inch drivers driven by 12 50-watt amps. Using two cabinets also provided Peak with the ability to provide even coverage to both the front and transepts area with one VSA, the other covering the long-throw needs of the nave. Utilizing two VSAs let Peak program zoned coverage as needed. Aside from services, the church is utilized for social ministry events, weekly organ recitals and annual winter choral concerts presented by the University of Wisconsin, along with performances throughout the year by church’s six choirs, including a main 50-voice ensemble. In addition to the four VSAs used to cover the sanctuary, Peak installed two VSA 1250s in the rear to reinforce a choir loft area above the entranceway. As part of the audio upgrades to the building, Peak integrated a Symetrix Prism matrix audio processor front-end. “This allowed them to set up different programs depending on sanctuary’s usage, preset automix and audio console functions, integrate hearing assistance, as well as route distributed audio throughout the undercroft of the building,” says Keagy. The church maintains its historic preservation. Many of the church pews the congregants sit on are from the original building nearly 100 years ago. Church council members want to emphasize this is a rehabilitation, not a re-invention. An evolution — so to speak.